Some months ago I was a made a member of the Say No to Israel site. I don’t even know when. Nor have I ever commented on the site. My only interaction with SNTI was to post links to articles from my blog. A week ago I noticed that an Alex McGowin had posted a link on the Say no to Israel FB page to ‘Holocaust Deprogramming Course’. 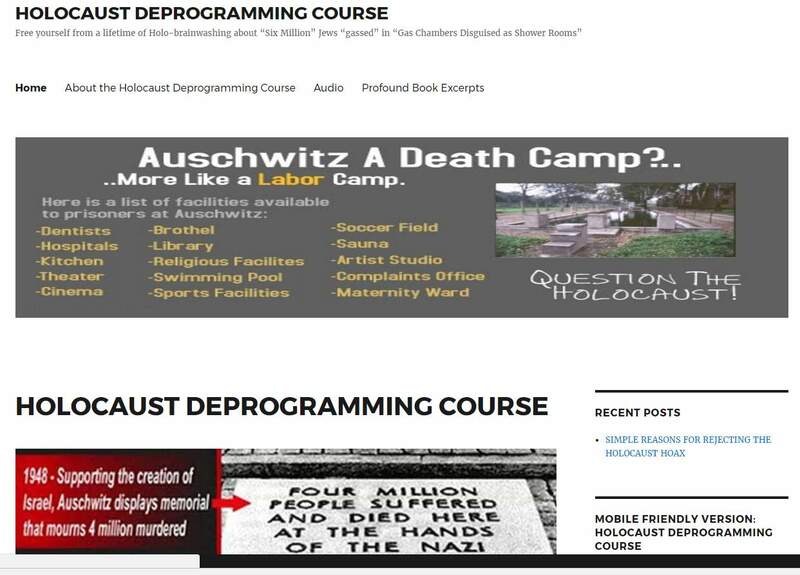 Curious as to what this might entail, I clicked on the picture and sure enough it led to a fully fledged holocaust denial site with all the same old nonsense. 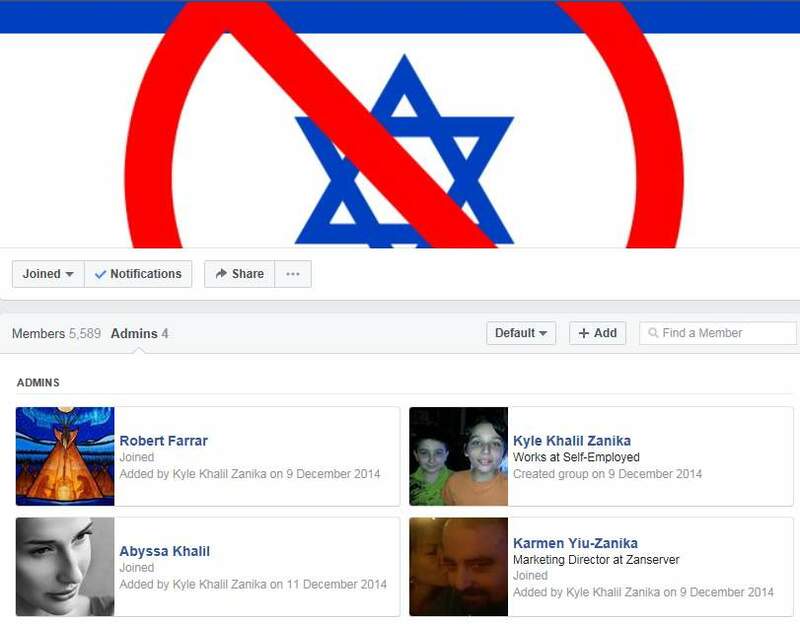 I therefore sent a message to the four Admins - Robert Farrar, Kyle Khalil Zanika, Abyssa Khalil and Karmen Yiu-Zanika – asking that this post be deleted. After this I thought nothing of it until a couple of days later, Kyle contacted me to say he was going to remove the post and when was it posted. By this time I couldn’t even remember the name of the FB group in question. When Kyle reminded me, I searched through all the groups of which I was a member and then a curious thing – I didn’t seem to be a member of any such group! The original post I complained about - am I a holocaust believer! It was therefore clear that I must have been removed by an Admin and when I put this to Kyle he said that the only admins were he and his daughter Karmen. The first lie which he told since there are 4 listed (see graphic). After pointing out that I had sent my message to all 4 admins he then said that a Robert Farrar had removed me because ‘he said you were posting things irrelevant to the cause.’ I’m not sure which cause he was referring to by this time. He then made a very curious remark. 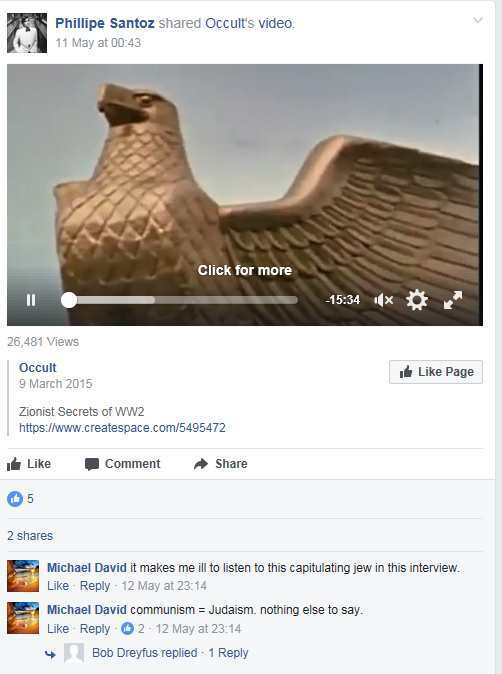 'Are you a Holocaust believer?' It’s like asking someone if they believe the Earth is round! Most people, strangely enough do. Kyle then informed me that the Holocaust is ‘very disputable’ on the basis that ‘some of my Jewish friends told me that it was the greatest lie in history.’ ‘Some of my best friends are Jewish’ is the standard response of anti-Semites but it still took me aback. Then he went on a ramble about the Holocaust having been 75 years ago when news was controlled by the Elite (whoever they are) and when ‘we had no way to check facts.’ I suspect even 75 years ago it was quite easy to check out facts. What became very clear is that Kyle had checked out nothing bar his own prejudices. I asked Kyle why he had originally said he would remove the post if he found nothing wrong with it, but there was no answer to this or indeed most of my other comments. Apparently Kyle is ‘100% semite’ whatever that is, but the Holocaust is irrelevant. At this point I was beginning to think that maybe Kyle was suffering from cognitive dissonance as nothing he said was making much sense. 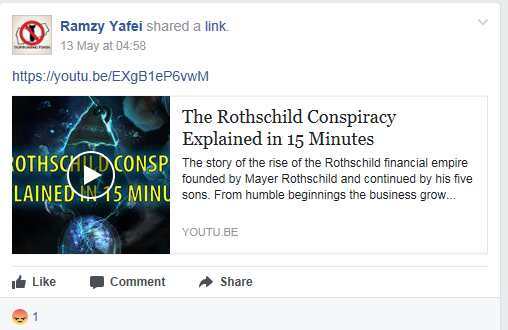 After challenging him to name his friends in Chicago I was told that he couldn’t do this as I might be the Mossad, though it’s difficult to know why Israel’s MI6 should be interested in a certified nutter. But at least his ‘many friends’ had now declined to just one anonymous friend. Kyle’s main reasons for believing the Holocaust didn’t happen was that there were only 5 million European Jews in 1939 so how can 6 million die? He had this on good authority from a 1939 New York Times article. Unsurprisingly he couldn't provide an exact date, meaning it will be impossible to check. In any case the Nazis were quite happy with a figure of 11 million in January 1942. though this was probably too high. 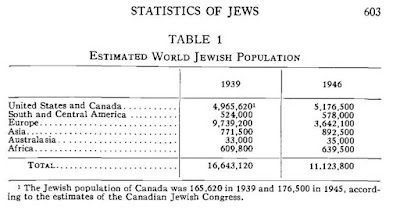 It is difficult to believe that there was a population explosion amongst Europe’s Jews between 1939 and 1942 such that the Jewish population more than doubled. The SNTI FB page has over 5,000 members so it is clear that many members are unaware of the fact that the site is controlled by neo-Nazis, anti-Semites or racist buffoons. Having undertaken a more in depth look at the site it is clear that there is a hard-core of fascists and neo-Nazis posting Holocaust denial and anti-Semitic stuff. I would hope therefore that most of those who are members would not want to associate with this site. It was the Hitler regime and anti-Semitism in Europe which led to thousands of Jews in the 1930’s emigrating to Palestine. 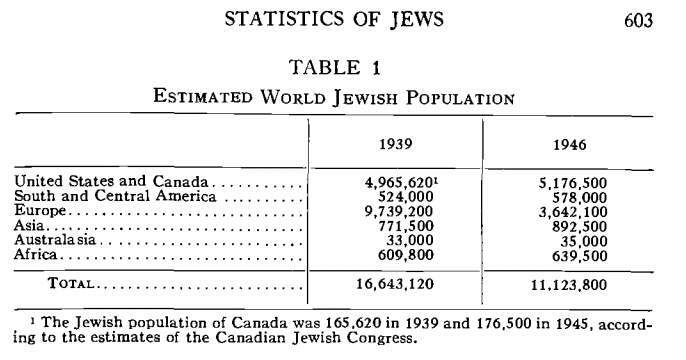 The numbers doubled from 209,000 Jews in Palestine in 1933 to over 400,000 in 1939. This provided the critical mass for the Jewish state-in-the-making. Without the Hitler regime in Germany, it is unlikely there would have been a Zionist State of Israel. To therefore post nonsense about there having been no Holocaust in Nazi occupied Europe is worse than stupidity. It is to give aid and comfort to the very political force that was responsible for the establishment of the Israeli state in the first place, a state which ethnically cleansed its Arab population in order to create an artificial Jewish majority. The Nazi apologetics of Robert Farrar, Kyle Khalil Zanika, Abyssa Khalil and Karmen Yiu-Zanika far from being a sign of opposition to Zionism are the very opposite. There is nothing that the Zionist movement wants to see than Holocaust denial in the Palestine solidarity movement. Why? Because it ‘proves’ that their opponents are anti-Semitic and thus provide s a powerful justification for the Israeli state and Zionism. Without anti-Semitism there would never have been Zionism but Kyle and co. are too stupid to understand this very simple piece of logic. Of course it is understandable why Kyle and his fellow fools are holocaust deniers. Zionism claims that the justification for and legitimacy of Israel is provided by the Holocaust. The Holocaust is, if you like, the historic recompense for the murder of 6 million Jews. 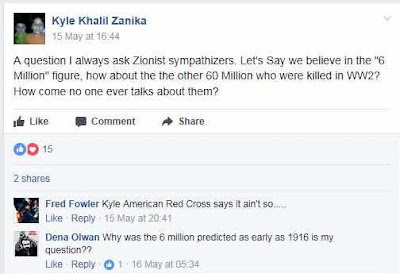 Kyle and friends, like Ahmedinajad in Iran, believe that if you deny the Holocaust then you deny the legitimacy of Israel. There is just one problem with this idiocy. The Holocaust took place independently of the use that Zionism makes of it today. It is a historical fact. The Holocaust happened. Its chief perpetrators, Eichmann, Himmler and Hoess the commandant of Auschwitz, all admitted that the Holocaust took place. Eichmann boasted of his role in a freely given interview with Dutch Nazi journalist Wilhelm Sassen in 1957 and Himmler was recorded in October 1943 explaining the reasons for the extermination of the Jews to senior SS officers in Posen, Poland. Looking through the list of members of the Say No to Israel site, it didn’t surprise me that arch racist and holocaust denier Gilad Atzmon is a member.